Updated: added details and link to Samsung site. Sprint today said its prepaid brands Boost Mobile and Virgin Mobile USA will soon sell the Samsung Galaxy J3. This inexpensive Android handset includes a 5-inch 720p HD screen, a 5-megapixel main camera with LED flash, and a 2-megapixel selfie camera. It is powered by a 1.2 GHz quad-core processor and carries 1.5 GB of RAM and 16 GB of storage. It supports memory cards up to 128 GB. The phone ships with Android 5.1 Lollipop and includes Samsung's Easy Mode for novice users. It packs a 2600mAh battery. 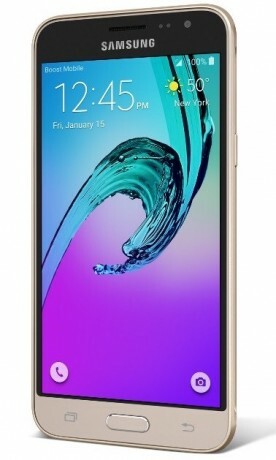 The Galaxy J3 reaches Virgin Mobile stores today and Boost Mobile stores next week. It costs $179.99. The Galaxy J3 may not look like much, but it performs far better than its meager price point would suggest. It's not perfect, but this low-cost Android smartphone for Boost Mobile is a good pick if you're looking for something in the middle of the pack. Consumer Cellular recently added four phones to its roster of inexpensive devices, including the Alcatel Pop 3. The Pop 3 (pictured) has a 5.5-inch 720p HD screen, 1.1 GHz quad-core processor with 8 GB of storage, 5-megapixel camera, and FM radio. Verizon Wireless has added the Samsung Galaxy J3 to its lineup of inexpensive smartphones. The J3, which has been for sale from Boost Mobile and other carriers since early this year, has a 5-inch 720p screen, 1.2 GHz quad-core processor, 16 GB (postpaid) or 8 GB (prepaid) of storage, 5-megapixel main camera with flash, 2-megapixel front camera, and 2,600mAh battery. Verizon Wireless today made the Samsung Galaxy J3 available to its prepaid customers. The phone, which has been available from Boost Mobile since earlier this year, features a 5-inch HD screen, 5-megapixel camera, 1.2 GHz quad-core processor, 2,600mAh battery, and 8 GB of storage with support for memory cards up to 128 GB. I would really like to see the A9 2016!